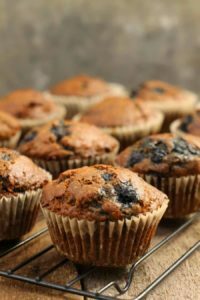 Simple, and delicious these blueberry bran muffins are perfect for a quick breakfast when in a hurry. Inspired by the traditional raisin bran flavor combo, these blueberry bran muffins are just perfect, when warmed and served with butter and a drizzle of honey. 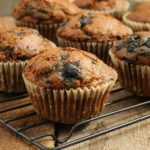 One of my favorite muffin recipes, these bran muffins where inspired by my daughter who LOVES blueberry muffins. She even helps out with the baking, dropping all the ingredients into the mixing bowl for me, and then scooping the finished batter into the individual muffin cups. The best part, making these muffins creates minimal mess, and are easily made in about half an hour! While some people argue that bran muffins are ‘healthy’, I would be cautious of labeling them that. 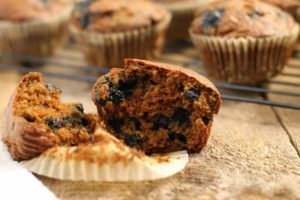 While definitely better for you then a fast food breakfast, bran muffins do contain quite a bit of sugar, fat, and carbs. 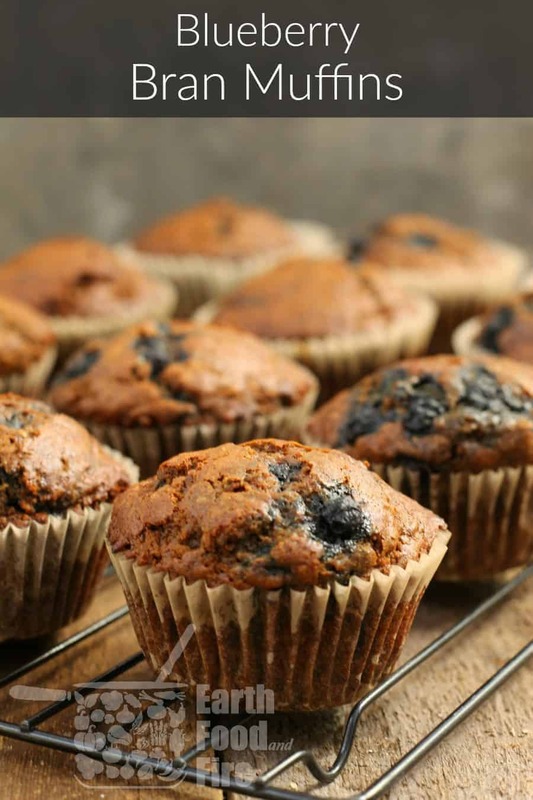 Bran muffins are definitely not a bad option though, and are a fantastic way of adding fiber, vitamins(vitamin B6), and minerals( such as iron and magnesium) to your daily diet. That said, if you are already eating a varied, and well balanced diet full of fresh veggies and other ‘healthy foods’, eating a bran muffin, or scone for breakfast won’t hurt! Just don’t eat the whole batch at once. You can easily freeze these blueberry bran muffins, making them ideal as a meal prep item. This recipe makes about 12 large blueberry bran muffins. If you plan on freezing some, feel free to double up the recipe to bake a bigger batch! Can I Make These Muffins Without Molasses? Of course! Simply substitute the molasses for 1/4 brown sugar, or regular white sugar. Alternatively you can substitute the molasses for 1/3 cup of honey or maple syrup. Pre-heat your oven to 400F and grease a muffin tin or line it with paper cups. I use the muffin liners from Paper Chef (affiliate link) and just buy them on Amazon every so often! Place the butter in a small sauce pan over low heat to melt as you mix the dry ingredients. The butter only needs to be melted, and doesn’t need to be super hot. 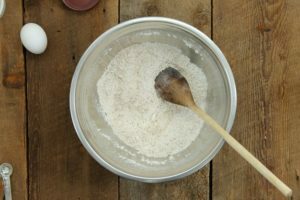 Mix the flour, bran, baking soda, baking powder, sugar, and cinnamon in a bowl. 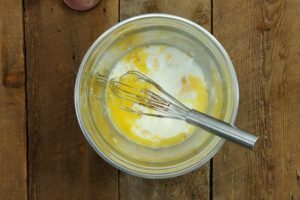 In a separate bowl, lightly whisk the egg, and then add the milk, molasses, and melted butter. Stir well to evenly mix all the liquids. Add the milk and molasses mixture to the dry ingredients, and stir with a wooden spoon(any spoon will do), until just combined. The batter should not be over mixed! 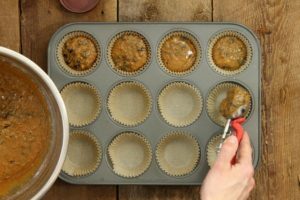 Spoon the muffin batter into the pre-greased or lined muffin tins, and immediately bake for 15 to 20 minutes or until the tops are slightly golden brown. Take the blueberry bran muffins from the oven, and cool them on a wire rack to prevent them from going soggy. Enjoy! Once cooled, I suggest storing the muffins in an airtight container in the fridge. This locks in the moisture, and prevents them from spoiling. Refrigerated, the muffins should last at least a week. If you made a double batch, Individually wrap the muffins, and freeze them in a freezer bag! Completely thaw them before warming in a toaster oven or microwave, and serving with butter. 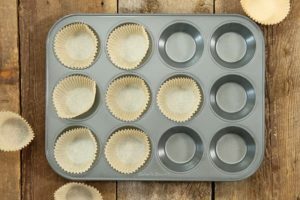 Pre-heat your oven to 400F and grease a muffin tin or line it with paper cups. Place the butter in a small sauce pan over low heat to melt as you mix the dry ingredients. The butter only needs to be melted, and doesn't need to be super hot. Take the blueberry bran muffins from the oven, and cool them on a wire rack to prevent them from going soggy. Lightly toss the frozen blueberries in flour before folding into the muffin batter. This helps prevent them from sinking to the bottom, and bleeding into the dough as much. Blueberry bran muffins are such a classic muffin! Hearty and filling, and perfect for any time of year! You can’t go wrong with a batch of these stashed in your freezer!